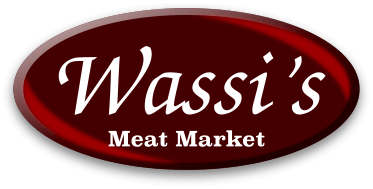 Here at Wassi's Meats we carry a wide variety of homemade desserts and salads for you to choose from in our deli. Our salads are prepared fresh daily and are made with only the top ingredients. A list of some of our homemade deli items are as followed: • Homemade Deli Meats: - Roast Beef - Pastrami - Turkey Breast • Homemade Salads: - Three Potato Salad - Bacon Cheddar Ranch Potato Salad - Cole Slaw - Smoked BBQ Baked Beans - Seafood Salad - Spinach & Feta Salad - Spring Pea Salad - Greek Summer Salad - Italian Antipasta - Pasta Salad and many others.... Custom made Party Platters are available upon request. Please allow a minimum of 48 hours for pickup. Cannot be prepared without a valid phone number,credit card and email address.We will email you to verify order and give you pickup time and date. All internet orders will be wrapped for two people. $5.99 lb Bacon, Cheddar Ranch Potato Salad - Think of all the best parts of a loaded baked potato, but in potato salad form. Crisp bacon, cool sour cream, crunchy green onions, and sharp cheddar cheese are all mixed up with red potatoes and a hint of ranch seasoning. Guaranteed you'll need just ..
$5.99 lb These beans will steal your heart. The beans start off sweet, and then they gradually hit you with the tang from the barbeque sauce.They’re knock-your-socks-off yummy. They’re make-your-tummy hunger for more. Each bite will tingle your tongue.Loaded with slow smoked chopp..
$3.99 pt Wassi's Cole Slaw is always a hit at any get together. A creamy blend of tender cabbage, onion, Hellman's Mayo, Apple Cider Vinegar and just a touch of sugar. This item cannot be shipped. Local store pick up ONLY. This item cannot be shipped. ..
$5.99 lb What’s the go-to side dish for a hamburgers-and-hotdogs cookout? Pasta salad, of course. It’s hard not to fall for cold noodles with olives, roasted peppers, and Italian dressing. This item cannot be shipped. Local store pick up ONLY. CALL TO ORDER and AVAILABLITY ..
$4.99 1/2 lb A tasty blend of Penne Pasta with Spinach, Feta Cheese and a light Extra Virgin Olive Oil Vinaigrette This item cannot be shipped. Local store pick up ONLY. ..
$3.99 pt. Fresh Spring Pea Salad - Tender sweet peas combined with fresh chopped green onion, hard boiled chopped egg, Wassi's Own chopped bacon. Mixed with our own blend of seasonings and Wassi's Own Ranch DressingThis item cannot be shipped. Local store pick up ONLY. ..